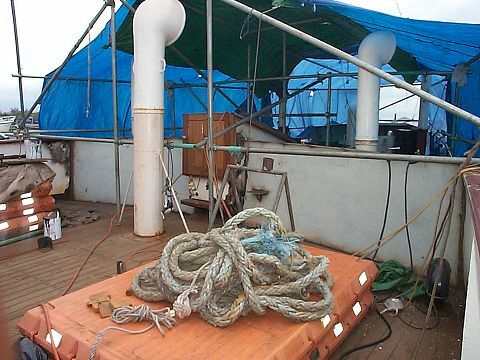 Over the past few weeks, work on the ship has progressed well, although the timing was always going to be tight to have her ready for the start of the season. 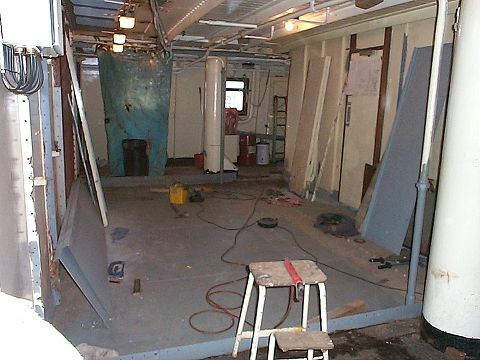 The crew utility area and bar store forward of the Britannia Lounge have had all the steel partitions and some of the deck plating replaced, and are now being repainted. The ladies toilets are nearing completion, the vinyl flooring has been laid and installation of the plumbing and cubicles is well under way. 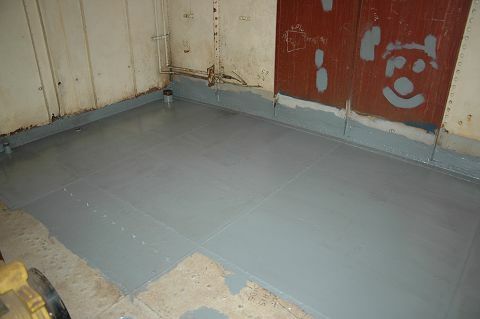 A flat bar edging strip is welded down to the deck in the ladies toilet prior to the concrete floor screed being laid. 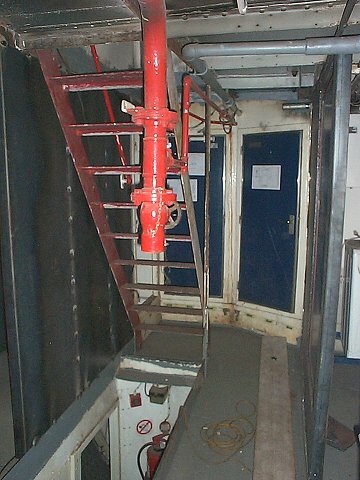 and brackets have been added to its forward face and the side of the forward accommodation hatch. 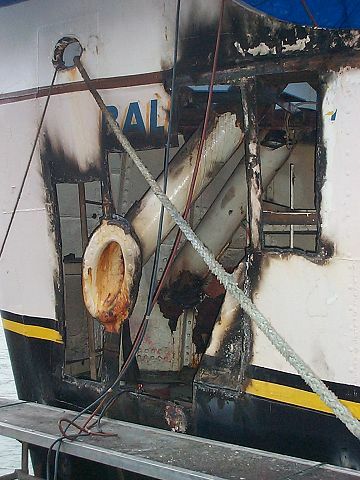 These brackets are for stowing various items including the forward deadlights, and the emergency handles for the anchor windlass. 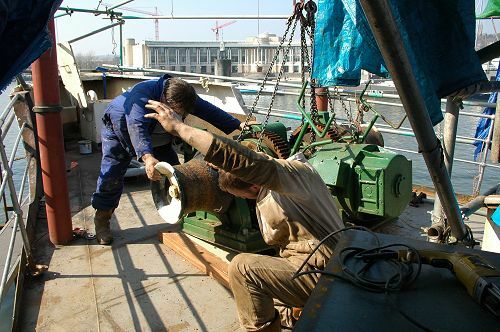 Having been rebuilt the starboard generator was test run today. 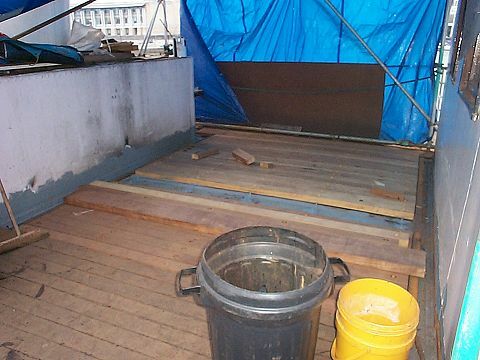 Replacement of the Pursers cabin deck was started recently, new steel plates have been installed and sections of the longitudinal stringers have been replaced. 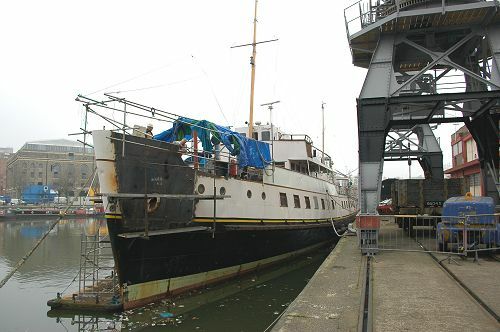 Work on the bow plating is complete and just requires painting. 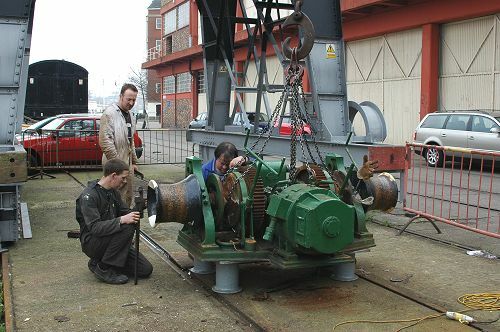 Fully overhauled, the anchor windlass is ready to be lifted back onto the ship by one of the preserved dockside electric cranes. 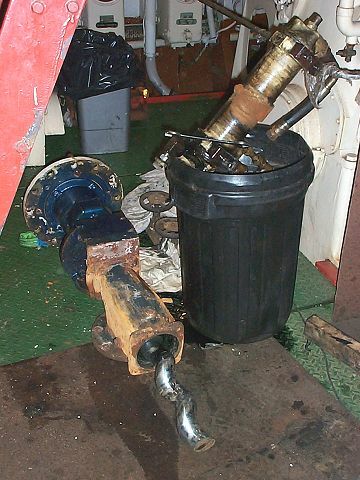 The windlass is positioned on its plinth and bedded down on sealing putty. 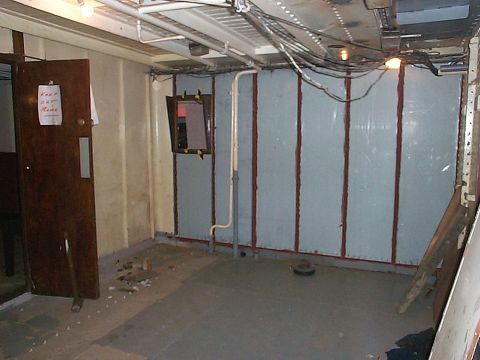 This series of photos shows the progress of the work on the ladies toilets. 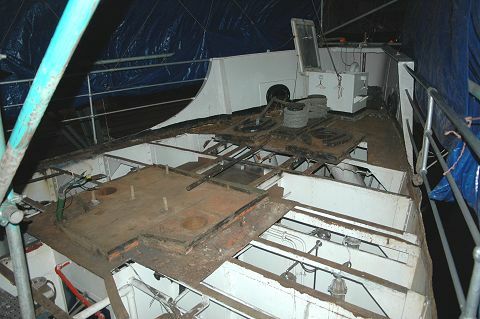 The deck plates have been replaced as well as the compartment side panels. 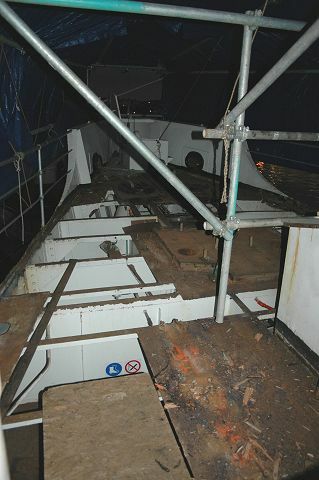 The foredeck is receiving some attention, the anchor windlass and deck fittings have been removed and the wooden decking stripped off. 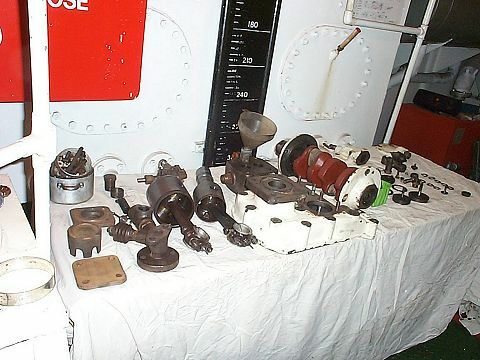 The windlass has been dismantled for overhaul and various parts re-machined or replaced. 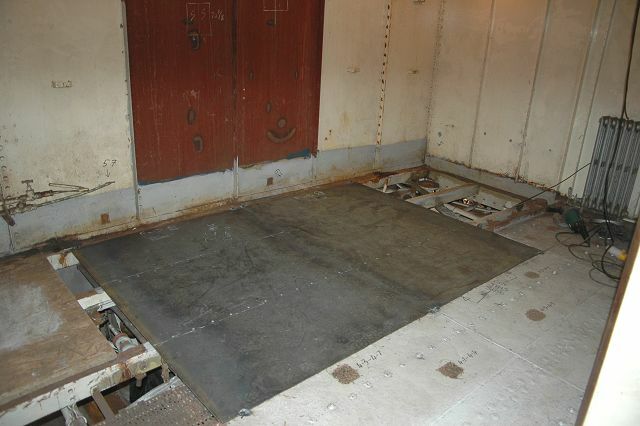 The transverse bulwark aft of the foredeck has been removed and the foredeck itself plated over with steel, this will be covered with new planking. 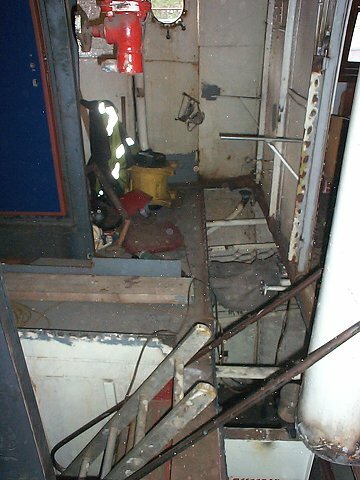 A section of deck between the front of the Pursers office and the back of the Engine room casing has been stripped, plated, and re-planked. 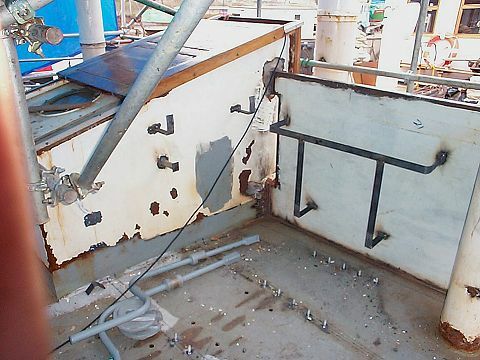 An area of hull plating at the bows is also being replaced. 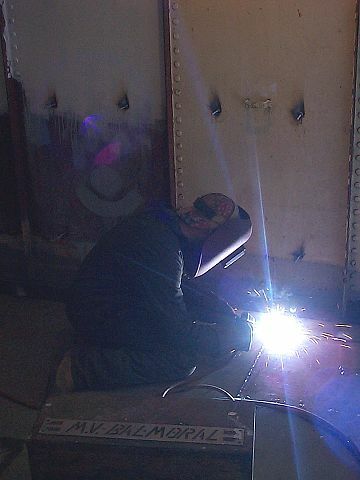 In addition to the regeneration works, the usual sort of winter work continues. 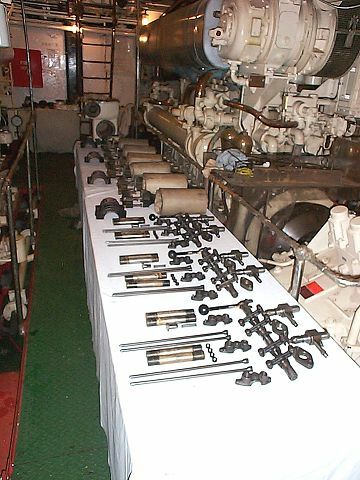 These photos show various machinery dismantled for survey and overhaul. 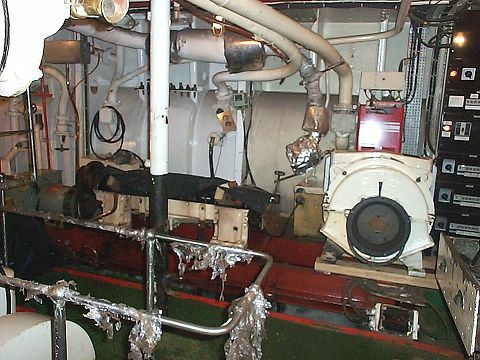 They are:- one of the compressors which provides air for main engine starting, one of the general service pumps, and the starboard generator engine. 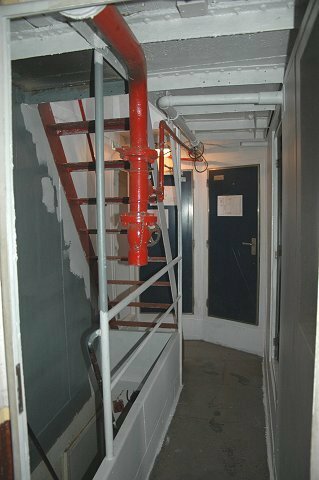 Shortly before Christmas, work started on the complete refurbishment of the ladies toilets. 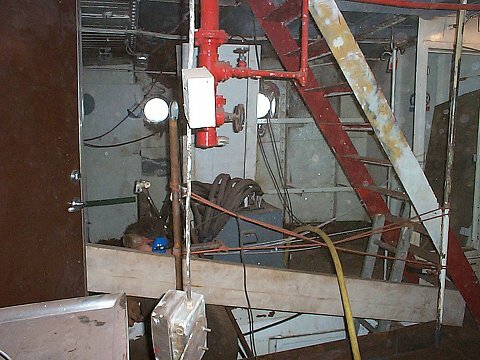 In this pic all the fixtures and fittings including most of the plumbing have been removed, and the floor is about to be taken up. 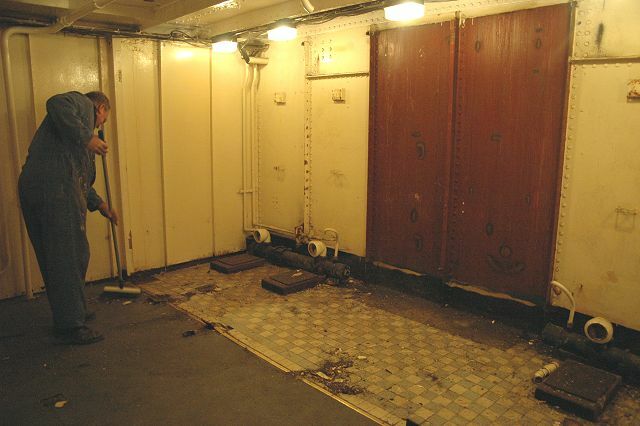 A large number of the original floor tiles have been salvaged, and it has been suggested that these might be re-used in some sort of detailing as the new flooring is likely to be a more hygienic vinyl system. 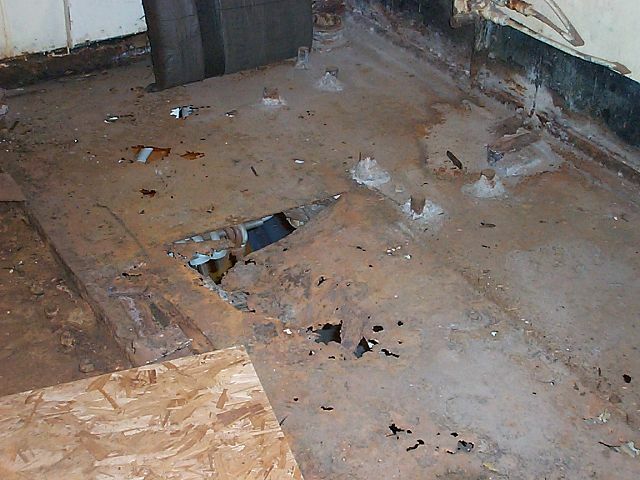 Removal of the cement screed revealed that the engineers weren't far from having an engine room toilet! 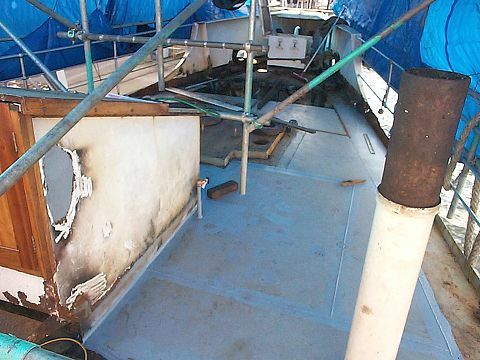 With the corroded platework out of the way, the angle frames have been cleaned up and checked, and the first two sections of new steel positioned ready for welding.